Let’s leave aside for a moment that Flair’s career is over, and that his wrestling days were full of “proudest moments” inside the ring and out, and that, as my podcast partner Peter Rosenberg pointed out, Flair probably broke down crying when he heard they were serving sloppy joes at the arena Monday night. Both Charlotte’s win on Sunday and Flair formally introducing her as the new champ Monday night were supremely touching moments. You could see that Flair understood how rare Charlotte’s success was — most legendary wrestlers’ kids coast on their parents’ names to mediocre careers. Flair knows this because his eldest son, David, had an unimpressive WCW run. But more meaningfully, Flair’s younger son Reid was starting out as a wrestler when he died of a drug overdose, which inspired Charlotte to pursue a wrestling career. And even though it hasn’t been a lifelong dream, Charlotte has excelled, using her peerless athletic gifts to become a burgeoning in-ring megastar. Early in the title match, when Charlotte vaulted outside the ring and seemed to jam her knee, I bought it. (I’ve always been surprised that similar injuries don’t occur more often in pro wrestling.) Through some odd combination of acting chops and awkwardness, Charlotte looked like the knee had forced her to go off script. But when she got back in the ring and Nikki started attacking the knee, it was clear it was a work, as they say in the biz. In this modern age of know-it-all wrestling fandom, it’s uncommon to see such a convincing put-on. But it’s even more rare to see what happened postmatch: a moment of sincere, profound emotion. When Charlotte and Flair embraced and cried, WWE achieved something that promoters have been striving for since the dawn of pro wrestling: reality in the ring. Both of the last two matches at NoC featured sniveling baddie Seth Rollins. In the first, he lost his U.S. Championship belt to John Cena.2 In the second match, Rollins successfully defended the World Heavyweight Championship against Sting. Before the show, I’d wondered if booking Rollins as an ironman would tempt fans to cheer for him. WWE’s decision to schedule the bouts back-to-back made Rollins’s endurance seem even more impressive. But Rollins didn’t get the chance to indulge in the crowd’s adulation at Night of Champions. After he beat Sting, Rollins was attacked by Sheamus (who attempted and failed to cash in his Money in the Bank title shot) and then by the Demon Kane, Rollins’s old compadre turned nemesis. Rollins didn’t even receive the laudatory message board posts from smark fans impressed by his fortitude, because wrestling’s online intelligentsia remained more concerned with something else that happened in the main event: Sting got hurt. Toward the end of the bout, Sting, who is 56 years old, started wobbling oddly. He had already taken separate scripted dives through an announce table and off the top rope to the floor outside the ring. But the critical exchange apparently came when Rollins powerbombed Sting into a turnbuckle. Sting reeled awkwardly and his legs went rubbery. When Rollins flung him against the far ropes, Sting ran into them, turned around, and then crumbled to the mat. 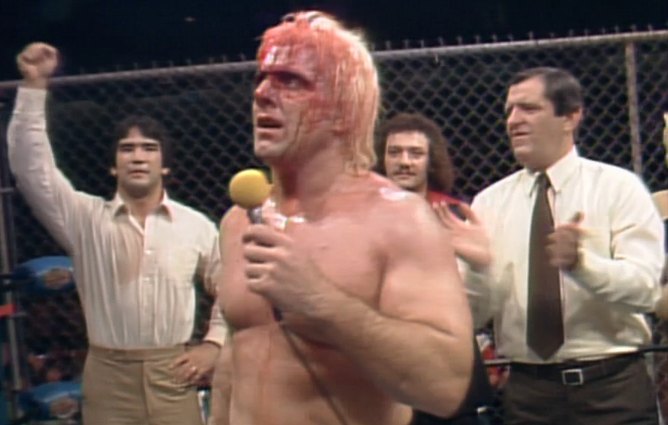 Color commentator JBL tried to make it part of the story: “Sting is spent, absolutely spent. He might be hurt.” I actually thought it was part of the story. One of the cardinal rules of pro wrestling3 is that if it happens onscreen, you’re supposed to be seeing it. In the context of the match, Sting’s injury made sense. Sting is getting on in years, and his advanced age felt reinforced by the highlight packages WWE ran in the lead-up to the Rollins match, since seeing Sting’s glory days emphasized just how long he’d been wrestling. Sting’s high spots on Sunday might have been intended to show he was still in top form, but they could have also been to tell the story of an old dog pulling out all the stops and coming up short. Sting’s injury also felt of a piece with the entire Night of Champions show, which plied old-school storytelling to wonderful effect. Charlotte’s faux knee injury and the subsequent working-over by Nikki Bella was one example, as was Kevin Owens’s systematic attack on Ryback’s shoulder en route to claiming Ryback’s Intercontinental title. Dolph Ziggler’s win over Rusev told a simple, self-contained story; the Wyatt Family’s win over Dean Ambrose, Roman Reigns, and surprise partner Chris Jericho did them one better, (re)introducing Jericho and writing him out within the confines of a single match. It was as if all the venerable old wrestlers who work backstage as “road agents” or “producers” were given free reign to ignore the monotonous “WWE style” and just tell stories in the ring. And booking a Sting collapse, while conceivably distasteful, wouldn’t have been entirely out of line for WWE, which worked a Triple H concussion angle two years ago before pretending the story line never happened. But as it turns out, Sting really was hurt. And, strangely enough, that was also in tune with the night’s previous events. Because the intrusion of reality at Night of Champions didn’t end with the Flair family celebration. Before the Wyatt Family’s match with Ambrose, Reigns, and Jericho had a chance to begin, a fan climbed into the ring and stood next to the wrestlers. He was quickly tackled by security and subsequently sentenced to 10 days in jail, but not before making it onto the TV screen. Bray Wyatt took it in stride, sardonically asking his opponents, “Is that your man?” It wasn’t, but it’s strangely not unusual for Reigns and Ambrose. The former members of the Shield have been a particular target of this sort of psycho fandom, with Ambrose, Reigns, and Rollins all experiencing fan run-ins in recent months. This phenomenon isn’t a new thing. Old-timers speak proudly of the rough-and-tumble days when heels would anger the crowd to the point that fans would throw bottles and chairs at the bad guy, assault wrestlers as they passed by with hat pins and cigarette butts, and storm the ring with malicious intent. To elicit that kind of response was the sign you’d done your job well. Maybe a return to those days is a sign of wrestling’s return to mainstream significance, or maybe it’s just a sign that a decade of catering to the lowest common denominator is paying off. 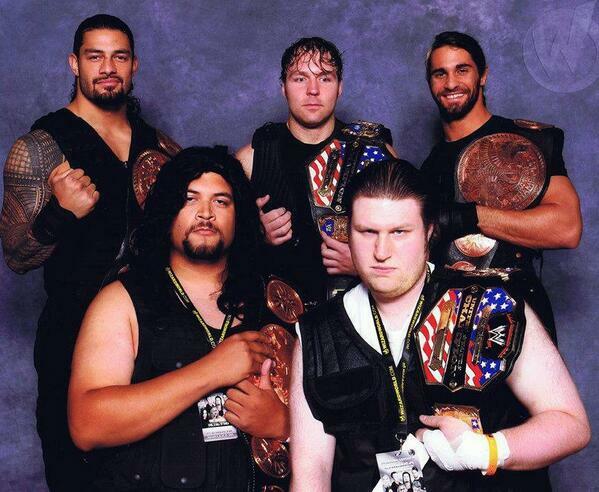 Maybe the Shield is getting targeted because they’re cool, or maybe it’s because they’re so easy to cosplay. Maybe their gimmick of coming to the ring through the audience (which Reigns still does) is egging on certain fanatics. WWE prosecutes these intrusions to discourage copycats, but perhaps it should consider airing its shows on a slightly longer delay so it can edit out fan run-ins entirely. Or, if WWE remains determined to prosecute, maybe it should bring the punishment in-house, à la Eagles Court.4 And it should. This needs to stop. But all of that disregards that fan run-ins are part of the fabric of pro wrestling. If today’s fans are more aware of wrestling’s falsehood than they were in previous eras, then they’re also more attuned to the ways in which WWE is like reality television — and the flawed notion that any moment of widespread attention is a positive thing. (If this is the case, WWE’s reality shows — Total Divas and especially Tough Enough — set an odd precedent.) Certainly, the people who jump barricades to try to get on TV don’t deserve even the ambiguous publicity a mention in this column provides. But to pretend they don’t exist is to ignore a century of pro wrestling history. Wrestlers have always egged on the crowd, and it has worked because of wrestling’s tenuous relationship with reality. Ox Baker, the Fabulous Kangaroos, Fritz and Waldo Von Erich — the list of riot-starters is endless. No sane fan should ever run into the ring strictly because of the security threat it poses for the fan and for the wrestlers. But the primal desire to help your heroes is at the heart of pro wrestling. Well, that and the mock violence that provoked crowd riots in the Territorial Era. It’s hard to see our idols suffer. In Sunday’s main event, one of the industry’s true legends might have met his real-life career demise. Even if Sting recovers from his injury, it’s hard to imagine WWE putting him in another position where he could get hurt on a big stage. But there’s the tension — what made Rollins-Sting compelling was the question of reality, the prospect of real injury, and that’s precisely why it can’t happen again. Not that other performers won’t also suffer injuries. The Undertaker, at age 48, was taken straight from WrestleMania 30 to a hospital. Jerry “The King” Lawler, at age 62, had an on-air heart attack after a match. Vince McMahon, who just turned 70, was taking finishers from CM Punk and Brock Lesnar just a couple of years ago. Pro wrestling is about two things: entertainment and mortality. Sometimes, like during Sunday’s main event, the latter upstages the former. Sometimes, like at the end of Monday’s Raw, when Kane emerged from underneath the ring, it’s strictly entertainment, a cartoon of mythological pugilism. Sometimes, like at next month’s Hell in a Cell PPV, it’s mortality as entertainment. We can look forward to a month of promo packages about wrestlers putting their careers on the line in the Cell, with references to performers, like Mick Foley, who actually did. Night of Champions should have been a minor triumph for Rollins, wrestling in back-to-back title bouts, but instead it was a surprise valediction for Sting, whose career may have ended before our eyes. Sometimes mortality jumps the barricade and runs into the ring. It was the most compelling — and unfortunate — way the match could have gone. But if Rollins didn’t receive the plaudits he deserves for his durability, he should at least get credit for his metaphorical flexibility. Because I’m not sure any wrestler has swung between the entertainment and morality poles as quickly as Rollins did Sunday night. Even though Sting’s injury wasn’t his fault, Rollins was part of the match that legitimately injured a legend, and that match was followed by Sheamus’s cartoonish failure to cash in the MITB briefcase, a Benny Hill–style comedy of errors that was brought to an end by Kane’s surprise run-in. Over the past several years, Kane has vacillated between his original character — a semi-satanic force of nature — and a more human (if scarier) version, most recently as WWE’s suit-and-tie-clad director of operations. “The Demon Kane” is a cartoon character who summons thunder from the rafters and dwells in a fiery pit beneath the ring, or underground, or something. “Corporate Kane” is the co-opted functionary, a cog in the WWE machine. On Sunday he returned — in Demon garb — from an ankle injury inflicted by Rollins, and on Monday night he appeared in his corporate incarnation, seemingly oblivious to the Demon’s existence. Whether it’s a split personality story line or a long con is unclear, but one thing is certain: When the Demon Kane tore through the mat to pull Rollins into his private hell at the end of Raw, entertainment won out. It’s not a bad thing. Pro wrestling has always been served well by a proportional helping of silliness to balance out its grislier aspects. Ric Flair is the poster boy for this dichotomy, with his often goofy flopping around the ring contrasted by his willingness to shed real blood and even realer tears. Almost every match in his career has featured a move in which he climbs to the top rope for a crossbody, only to be slammed off by his opponent, in reference to the one time it actually worked, when he won the NWA title from Harley Race. That was the original proudest moment of his career, and every top-rope bump since then has been a wry reference to it. Every match is a play on some real emotion, or some real caution of mortality. At Hell in a Cell, Brock Lesnar and the Undertaker are having their rubber match inside a steel cage, a match that will certainly be performed under the shadow of Sting’s recent injury and Taker’s post–WrestleMania 30 hospitalization. Playing a joker card in the semi-main event with a corny Kane-Rollins match isn’t a terrible idea. But here’s the real question: At the end of Raw — when Kane was dragging Rollins into his ridiculous arena-floor inferno, when Kane was pulling him away from the harsh realism of his match with Sting and into a low-impact sulfuric simulacrum — why was Rollins fighting so hard to resist? Paige has since turned on Charlotte, to hardly anyone’s surprise. He had defeated Cena in a title-versus-title match at SummerSlam to claim both the U.S. and World Heavyweight titles. First enunciated, as far as I know, by the inimitable Rick Scaia. It would make a great WWE Network show if it weren’t so obviously problematic. David Shoemaker , also known as “The Masked Man,” is the author of the The Squared Circle: Life, Death, and Pro Wrestling.